All student pilots must achieve 90% on the PSTAR written examination before being issued a Student Pilot Permit. As well, foreign pilots seeking conversion to Canadian licences and military pilots must also succeed on the PSTAR written. 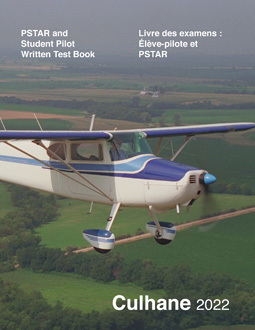 This testing manual contains all 200 Transport Canada PSTAR questions, re-organized into 4 sets of 50 question PSTAR aeroplane exams, along with supplemental questions for helicopter applicants. Our PSTAR exam manual has been designed to be used in conjunction with our Private Pilot and Recreational Pilot Ground School Course, and includes cross references for every PSTAR question so as to permit fast track learning of the required background subjects. Using our course text and this PSTAR manual will provide everything you will need to self study for the PSTAR examination, and no additional texts or regulatory sources will be required.